Atlanta, GA, April 3, 2019: With sold out labels all over flyers, it is not surprising that Atlanta is the city of choice for so many popular entertainment shows. In an era of electronics and Imax movies, it is heartening to know that traditional art forms such as theatre, even in regional languages like Bengali, with its niche audience, finds its patrons and turns out to be a sold-out show. Dr. Raktim Sen, through his Atlanta Theater Workshop, Inc, strives to present his productions with creativity and dedication. On March 17, a houseful audience enjoyed two popular Bengali plays: DenaPoana (Dowry) and Chor (The Thief) presented by Dr Sen at the Eddie Owen Presents: Red Clay Music Foundry in Duluth. Richa Sarkar, who used to be a TV and Radio host in Kolkata introduced the storylines of the plays with wit and vigor. DenaPoana, based on a short story by Nobel laureate ‪Rabindranath Tagore, sets a modern day parallel to the age-old dowry system and its evils. The modern day would-be-bride finds herself in a situation not too different from Tagore’s protagonist bride Nirupama, who would not allow her father to pay the dowry he “owed”. The cleaver usage of a simple screen for Nirupama to reflect her own thoughts as the play progresses gave way to clear interpretations of the narrative. Chor, a short play based on a story by Swapnamoy Chakraborty featured a thief who is forced to come out of retirement just to prove that he still has the Midas touch! The Thief, mistaken for a businessman, is kidnapped and the ploy to extract ransom from an upset wife, leads to hilarious consequences. After pondering each year about the next play, Dr. Sen decided to stage two short plays instead of a full length one. “Out of the ten plays we had staged, seven are full-length and three short one-act plays. We needed to change that,” said Dr. Sen. Having read the script of DenaPaona several years ago, Dr. Sen says he was not sure if the serious note of the play would appeal to the audience or be relevant in current times but took the plunge anyway. “We needed another play to go with this and Chor fit the bill perfectly. It is out and out a comedy of high quality,” he added. 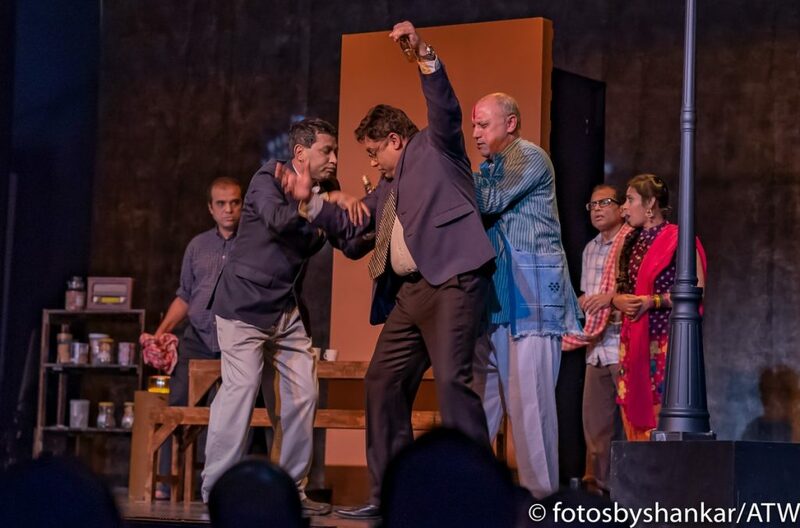 The ensemble cast and crew of Atlanta Theater Workshop brilliantly adapted by eminent playwright Soumitra Basu and directed by Dr. Sen backed by apt background score and props with heartfelt performances enhanced the theatrical experience. You may check www.atltw.net for complete cast and credits. ﻿READ THE REPORT IN OUR APRIL 2019 E-PAPER!